Hi there! Did you make any bear paw blocks? I almost wrote bear "claw" .. yikes, my pastry problem outs itself! It was a cozy rainy day here yesterday so I got to work on my meow quilt. It's cave dweller time here, dark and gloomy, so the picture color isn't great, but you can see how totally cute those Sunrise Studio scallops look with my Pam Kitty Garden fabric. Hopefully today I'll finish this up and figure out if I'll try and quilt it myself or have it quilted. Are you sewing? Have your shopping done? I'm totally in denial about Christmas. And it's the 16th. Crazy. Tell me about what you're up to.. if you have the time. By the looks of Instagram and Facebook, everyone is busy busy! I'm loving all the Christmas decorations and all the fun sewing projects. My friend Suzanne from Strawberry Patches in Bakersfield spent the weekend making some cute things from Pam Kitty Garden, check her Facebook page here. After making that pile of bibs I swore I won't make another but then Pam Kitty Garden arrived and I couldn't help but make a few more. Fabric has strange powers over me. Love how straight your letters are. Can't wait to see the whole quilt top. I still need to do baking, but each year I bake less - our youngest daughter and her friends are coming this weekend to do their yearly fun baking and decorating and I love how they decorate cookies - I have very little patience for that. I've been experimenting making fudge. The second batch I put those chocolate/cherry chips in and it had just the right hint of cherry so I proceeded to eat 50% of the batch! Yikes. Finally gave the rest of my husband told him to not give me any even if I begged!! All my shopping is done. Packages mailed. I'm finishing up on the Snowman wall hanging from Lori Holt. Then, I'm back to working on my "fancy foxes" throw... So glad you are having rain. My mom said the central valley has been devastated by the drought. Farmers are pulling out almond trees which need more water. 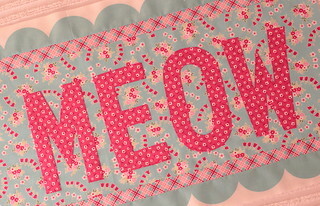 A Meow quilt??? HURRY! We MUST see!!! Still putting bindings on pot holders and haven't really wrapped any presents, Gulp. I always love buying stuff and then the pretty paper and ribbons but have such a tough time getting it done! Love the Meow, really love it! I'm not done with Christmas shopping, and I'm in a sewing slump. Therefore, right now I'm in panic mode! I've been baking and hosted a few parties. Shopping is not complete although I have a good bit done. The most exciting thing that's happened is receiving my first order of Pam Kitty Garden! I ordered the Pansy fat quarter bundle and I LOVE it so much! I can hardly wait to see your meow quilt and to work with this beautiful fabric! The meow couldn't be more speCATular. (I thought of the cat part on my own, believe it or not.) Tracey would love this.